Many homeowners looking to remodel their bathrooms are concerned about the financial and practical implications of the project, but sometimes a facelift is all you need to give your bathroom a completely new feel and life. A bathroom facelift costs significantly less than a bathroom remodeling project, which can range anywhere from $20,000 to $40,000. A minor remodeling of major furnishings like a sink/cabinet unit or bath tub without making any changes to the plumbing, floor plan, or electrical components can cost between $8,000 and $15,000. 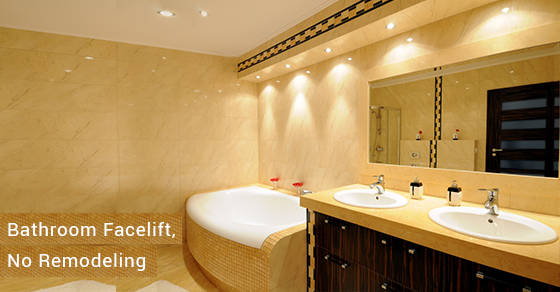 A facelift remodel involves making simple and fairly easy changes to your bathroom. Some quick bathroom facelift ideas include replacing items that can be easily removed and reinstalled, like tiles, toilets, and sink tops. Replacing such items is relatively easy, yet updating them can drastically enhance the look and feel of your bathroom, especially if the furnishings have been there for decades. Facelifts are the least expensive type of remodel, depending on the number of items you intend to replace or add. Other items you can play around with are light fixtures, mirrors, and hardware accessories, or add non-existent furnishings, like appliances or a medical cabinet. Test different bold colors on your wall, like orange to complement white tile. A complete facelift could include applying a bold wall color, adding a vibrant striped area rug, and fixing some shimmering chrome fixtures. Tiling a whole wall or tub surround can be costly. Instead, fix a selection of differently colored and textured tiles in the area above the sink vanity. For instance, using small mosaic tiles of blue, white, and brown colors can introduce color and pattern in your bathroom, and give the vanity area a rich and luxurious look. You don’t have to invest in costly artwork to make a difference in your room. Simple, personalized artwork can add a bit of color and interest to an otherwise plain wall. Paintings and other types of artwork are easy to install at a low cost, though they should not be so detailed that the humidity in the bathroom can damage them. Proper lighting can make a huge difference in that small space. If you don’t have sufficient light, consider installing one or two fixtures in the right locations, so you have light from above the mirror and both sides. If you have heavy window treatments, consider replacing them with sheers that let in natural light while ensuring privacy. The right combination of light will help you see yourself at your best. Other things to consider include installing wallpaper, adding a colorful shower curtain, adding shutters and rags, or implementing décor. A facelift remodel can cost between $2,000 and $7,000 or less, depending on the number of small changes you intend to make.